Above: The dome of St. Peter's is the Vatican's best known landmark. It is often attributed to Michelangelo. However, some scholars assert that what we see is actually a modification of Michelangelo's concept by Giacomo della Porta. Although it is surrounded by the city of Rome, the Vatican is an independent state. Indeed, it is the world's smallest independent state covering about 110 acres. It has approximately 800 citizens but a few thousand priests, nuns and lay workers commute to work there each day. Accordingly, the Vatican has its own military, police, television and radio station, and post office. Of course, they are proportional in size to the community. The head of state is the Pope. However, the Vatican is not just a miniature country. It is the headquarters of the Roman Catholic Church. The Holy See, the episcopal jurisdiction of the Pope, administers to the spiritual needs of over a billion Catholics worldwide. The official languages of the Vatican are Latin and Italian. However, Latin is generally reserved for religious ceremonies and for functions of the Holy See. The Vatican is a visitor-friendly country. Millions of tourists come each year and the Vatican strives to facilitate their visits. A large part of the Vatican is not open to the public. The most frequently visited areas are St. Peter's Basilica, St. Peter's Square and the Vatican Museums. 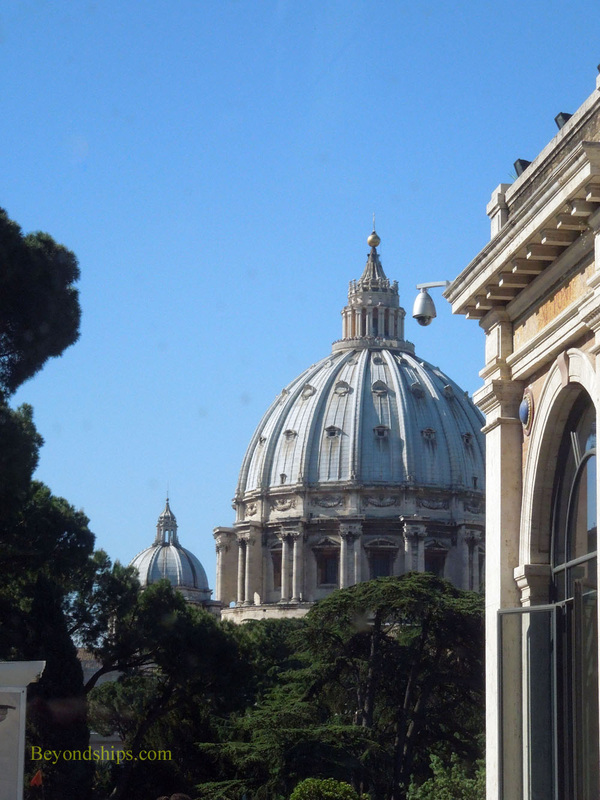 You can also take tours of the Vatican Gardens and the Catacombs under St. Peter's. These usually must be arranged in advance. There is a dress code for going into the Vatican buildings. Shoulders and knees should be covered. Men should remove their hats when inside the Basilica. In general, non-flash photography is permitted inside the Vatican. However, no photos or videos may be taken inside the Sistine Chapel. 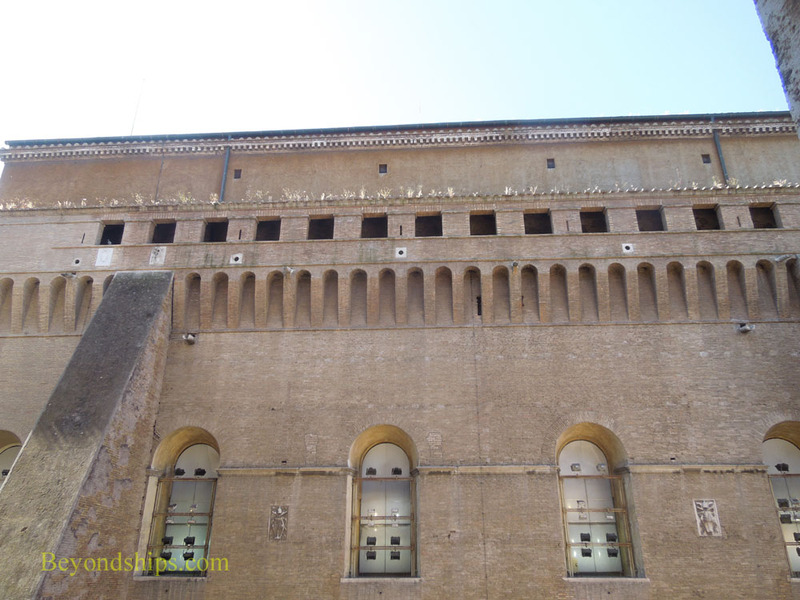 Above: The plain exterior of the Sistine Chapel gives no hint of the glorious art inside. Below: Not all of the territory of The Vatican is covered with buildings. There is also an extensive and attractive garden. Visitors are generally not allowed to drive in Vatican City and there is no public transportation within the city. However, inasmuch as it is a small area, everything is within walking distance. Independent travelers coming from the cruise port at Civitavecchia usually arrive via train. The station stop is Roma San Pietro. 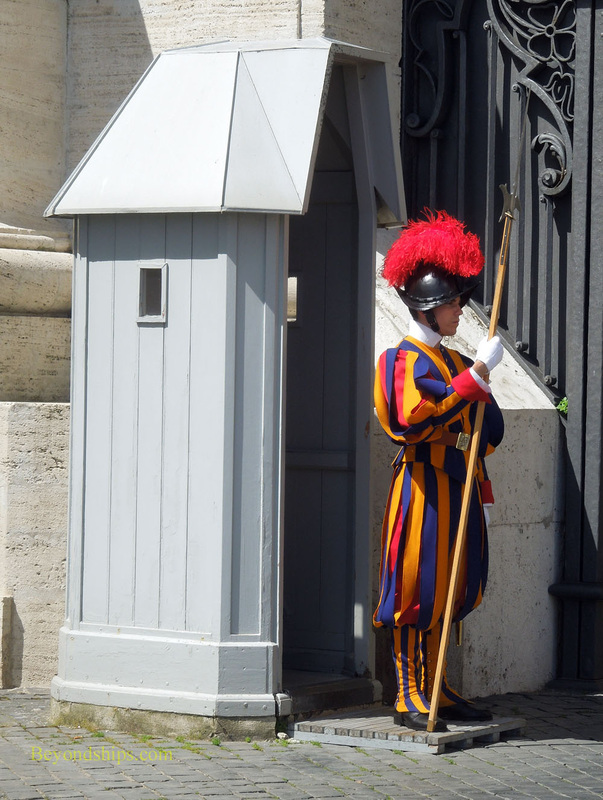 Above: The Swiss Guards are the Vatican's military. Their uniform design has been attributed to Michelangelo and Raphael. The story of the Vatican goes back to the first century. Peter, one of Jesus Christ's twelve apostles, came to Rome to spread the gospel. After the Great Fire of Rome, Peter was crucified by the Emperor Nero on the site where the Vatican now stands. As a result of the martyrdom of St. Peter and others, this area became important to early Christians. When Christianity became the official religion of the empire, a great basilica was erected here and over time it became the seat of the Pope and the Christian church. After the fall of the Roman Empire, the Pope became the de facto ruler of Rome. This arrangement evolved into the Papal States, which at its height gave the Pope temporal power over a large section of Italy. During the drive toward Italian unification in the 19th century, most of the Papal States including Rome itself were absorbed into the new country of Italy. Pope Pius IX refused to recognize Italy's right to rule and so confined himself to the Vatican, declaring himself a "prisoner of the Vatican." His successors followed suit until 1929 when the Pope entered into the Lateran Treaties with Italy, which recognized the Vatican as an independent nation.